Experience the productivity benefits of using two displays two LCD monitors or pair an LCD with laptop by purchasing the laptop tray attachment. Save valuable desk space and easily move your monitor to a comfortable height for viewing reducing eye, back and neck strain. Adjustable arm easily moves up and down through a 10.6 height adjustment range. Arm also moves in and out and side to side with ease so you can move your monitor out of the way when not in use or share your screen with others. Monitor is made from aluminum alloy and metal materials for an elegant yet strong and stable design. It is easy to install and comes with both clamp and grommet hardware. Internal cable management route cables neatly under arm. 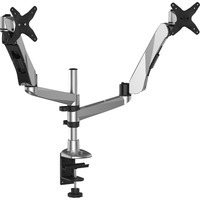 Monitor arm is designed for VESA MIS D 75 x 75100 x 100mm compliant monitors up to 20 lb. and 27.